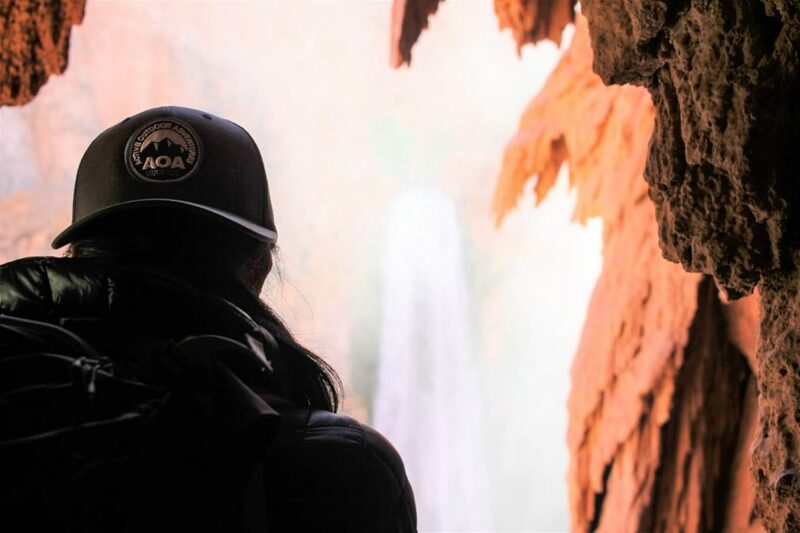 This adventurous week-long Grand Canyon and Havasu Falls tour explores the highlights and hidden gems of Grand Canyon National Park and Havasupai. The family friendly itinerary and accommodations include 5 nights camping comfortably in AOA’s oversized tents, all meals, snacks, and logistics planned out for you, and expert wilderness guides leading the way. The recommended minimum age for families to enjoy this trip is 10 years old. Can't decide between visiting Grand Canyon National Park or Havasu Falls? Do both! Our campsite on Grand Canyon National Park’s South Rim is conveniently located for hiking, visiting historic buildings and museums, and enjoying ranger programs of the South Rim. Spend 2 days here while your expert guide leads you to awe-inspiring views from the Desert View Watchtower, the South Kaibab Trail, and viewpoints to see the Colorado River and its rapids far below. 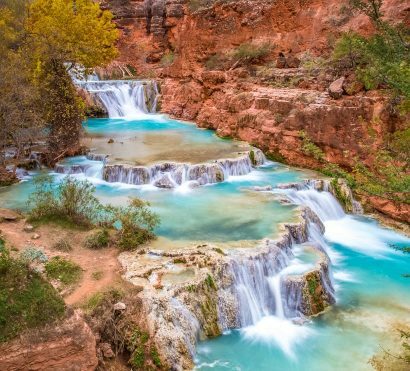 Next, hike into Havasupai, a lush and unexpected oasis deep in the bottom of the Grand Canyon filled with some of Arizona’s most spectacular waterfalls. 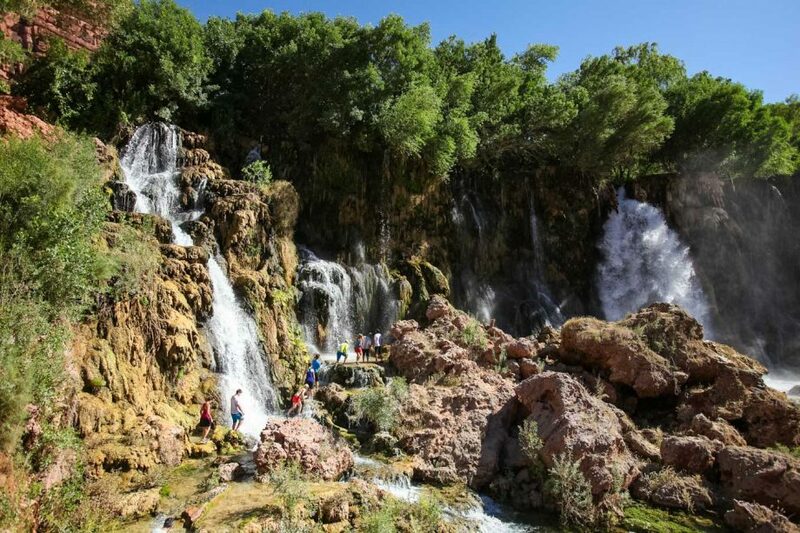 Havasu Falls is the perfect destination for an active family vacation. 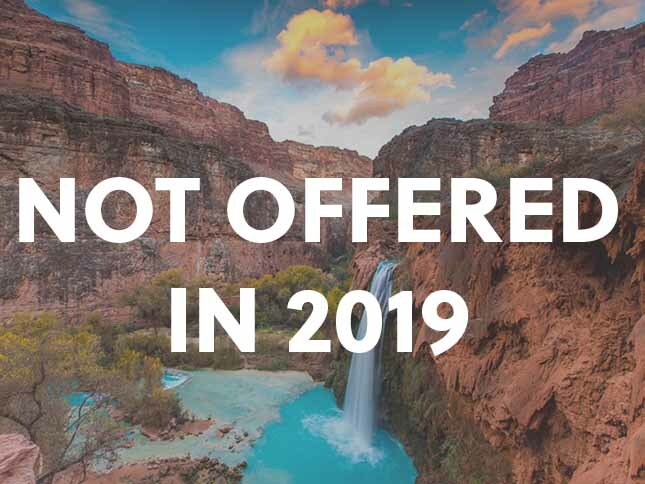 Enjoy swimming in the crystal clear Havasu Creek, camping beneath the stars, and embarking on fun kid-friendly activities like hunting for scorpions with a blacklight or searching for fossils. 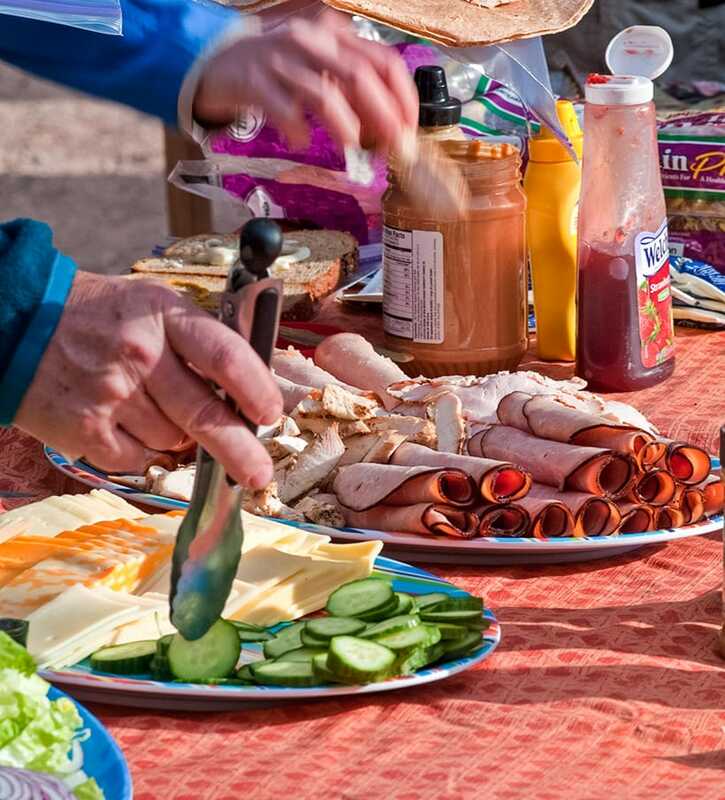 Your guides cook delicious meals each day to keep all members of the family fueled and ready for action to make this the most unforgettable family trip to Havasu Falls. Trip Start: Meets in Scottsdale AZ at 8 am on Day 1. Trip End: Finishes in Scottsdale, AZ between 6-8pm on Day 6. *Note: AOA’s recommended minimum age on this trip is 10 years old. We are happy to discuss each individual case to ensure this trip is the right adventure for your active family. Our journey begins with being picked up at our host hotel in the Phoenix/Scottsdale area and heading north. We progress through a series of different life zones as we climb above the Mogollon Rim onto the Colorado Plateau. Along the way our guides will explain the geologic forces that created this massive uplift and how the Grand Canyon formed. We pass through the town of Flagstaff at the base of the San Francisco Peaks, home to Arizona’s highest mountain, Mt. Humphreys, and surrounded by the world’s largest contiguous ponderosa pine forest. Past Flagstaff we are treated to the soft pastels and vast panoramas of the Painted Desert as we approach the Grand Canyon. Our first look at the canyon is from the historic Desert View Watchtower, a Mary Jane Colter building perched on the edge of the great chasm. An optional warm-up hike along the Rim Trail gives us some mileage and stunning views. Stops along this mostly-flat trail include the Grand Canyon Visitor’s Center, Yavapai Geology Museum, and Hopi House. Tonight we will settle into our Grand Canyon campground, our base for the next two nights. A delicious dinner awaits, prepared by our guides, after settling in to our tents. Today’s hike takes us down into the canyon along the South Kaibab Trail, famous for the best views of any trail in the park. 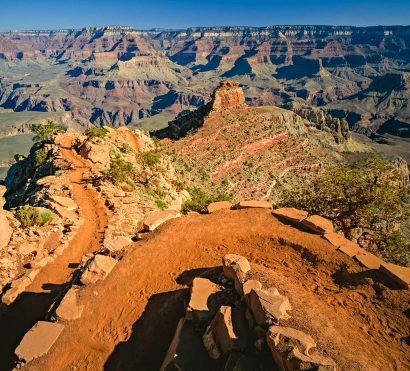 Built from December 1924 to June 1925 by crews working in both directions, this trail is one of the few in Grand Canyon National Park that follows a ridgeline rather than a fault line or side canyon, resulting in awesome panoramic views up and down the canyon for miles. We descend past Ooh-Aah Point to Cedar Ridge where we enjoy a gourmet lunch before climbing back to the rim. 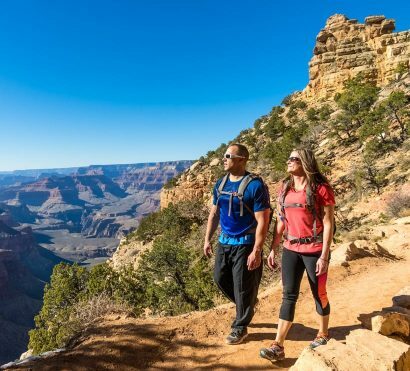 This hike is a great introduction to hiking in the Grand Canyon. We spend the afternoon exploring Grand Canyon Village, relaxing at camp, or hiking Rim Trail West. This section of the Rim Trail has famous viewpoints along its 7.8 miles, including Colter’s Hermit’s Rest, as well as shuttle service to return you to the campground on your schedule. Tonight we enjoy another fine guide prepared meal while recapping our adventures and swapping stories and playing games. After an early breakfast, we will drive to the trailhead, which is perched on the edge of the canyon. It is called Hualapai Hilltop (pronounced “Walapai”) and is the only land travel access to Havasupai and the world-famous Havasu Falls. Starting at an elevation of 5,200 feet, the trail to Havasupai switchbacks down for 1.5 miles until it reaches a dry streambed and levels out. Learn more about the hike itself in this blog post. After a trailside lunch, the canyon walls seem to grow taller alongside the trail as you descend deeper into the labyrinthine red sandstone of Hualapai Canyon. At mile 8 in our hike the canyon begins to widen and vegetation abounds as you get your first glimpse of Havasu Creek and enter the village of Supai, the most remote village in the U.S. where even the mail still arrives by pack animal. Here at 3,200 feet, after a welcome rest stop, the Cottonwood-lined paths will lead you through the village and into the canyon’s backcountry. A little further down the trail, you hike past 70ft. New Navajo Falls, 35 ft. Rock Falls and 100 ft. Havasu Falls. Soon after, you will arrive in camp. Estimated arrival time is between 3:00pm and 5:00pm. 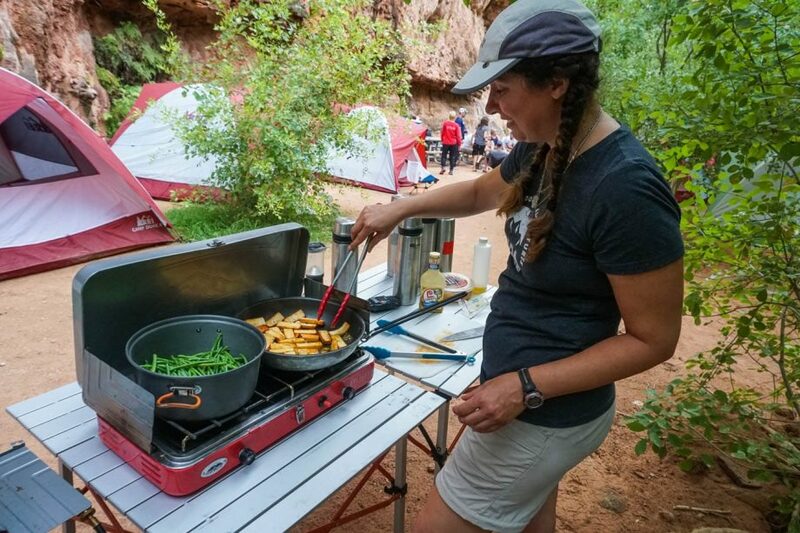 Use the afternoon to explore the Havasupai campground and relax at Havasu Falls while your guides prepare dinner. Sleep under the stars or retire to your spacious tent for a peaceful night of slumber. 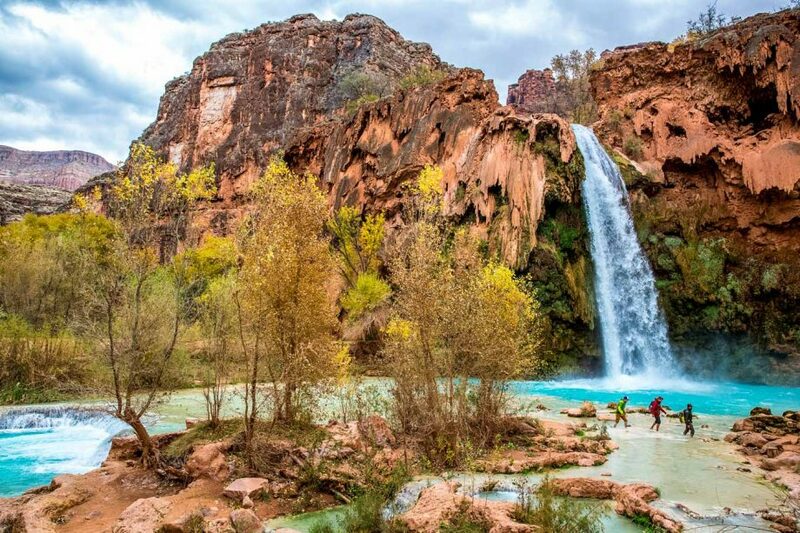 Awaken in camp, nestled beneath the towering cottonwood trees along the banks of Havasu Creek and a short walk from the canyon’s enormous waterfalls. You will find fresh-brewed coffee and a hearty breakfast waiting in the camp kitchen. 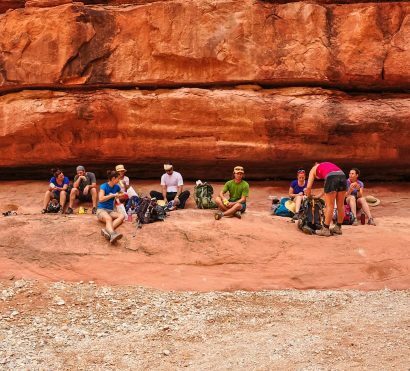 Every morning and afternoon your guides will lead you on hikes around Havasupai, some of the most spectacular and awe-inspiring treks in the world. Depending on the travelers in each trip, there will be options for kid-friendly activities available such as fossil hunting or catching frogs. Cross tropical blue streams and wade through lush meadows of wild grapevines, clamber up narrow side canyons with red rock walls towering thousands of feet overhead, even take a swim beside a 200 ft. waterfall. Each day you will dine on healthy, hearty meals prepared by your trip leaders. 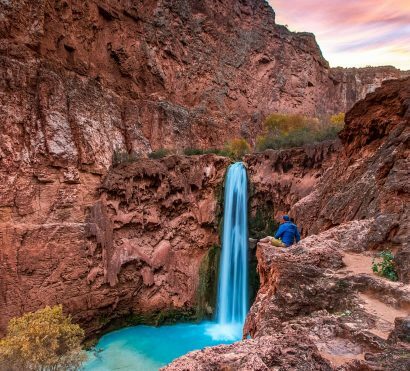 All the guided hikes in Havasupai are optional and you are welcome to choose to instead spend a lazy afternoon or morning reading a book in a hammock by Havasu creek. Remember, it’s your vacation and is designed to be as strenuous or as family-friendly as you wish. We have options from high adventure to peaceful relaxation. 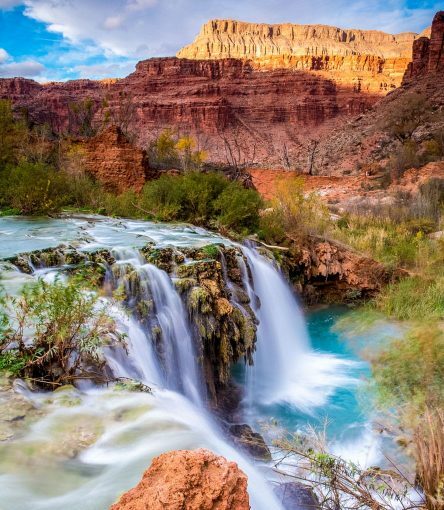 The scenery and magic of Havasupai and its majestic waterfalls will make you never want to leave, but after breakfast it is time to conquer the canyon and leave the blue waters behind! While always challenging, the exhilaration of reaching the rim is an amazing feeling you will never forget. 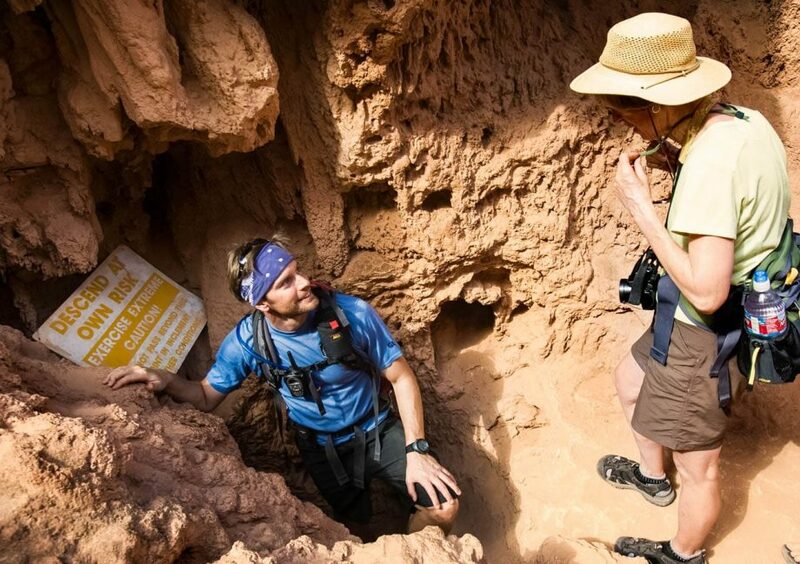 As you ascend the trail from Havasupai the canyon will feel like a familiar old friend. Often, our smallest hikers are our most enthusiastic. If you are traveling with your family, we will discuss each child’s ability levels in advance of the tour, to ensure they are capable of making the hike. Expect to arrive at the rim between 11:00am – 1:00pm. After reaching the Hualapai Hilltop, remember to look back at the magnificence of the canyon and allow a sense of your accomplishment to sink in. We will return to the Holiday Inn Express Hotel & Suites in Old Town Scottsdale between 6:00pm and 8:00pm. Bathrooms/Showers: On day 1 at Grand Canyon NP you will have access to flushing toilets and showers. The Havasupai campground has outhouses that use a unique composting system that keeps them quite clean. However, when wind blows we can sometimes smell them in camp. There are no showers available, so our guides will explain how to use Leave No Trace practices to bathe using water from Havasu Creek. During the drive to the Grand Canyon National Park, and from Havasupai back to Scottsdale expect to spend 4.5 – 5 hours in the van. On night 1 of this trip we camp near the Grand Canyon’s South Rim in a campground that can be quite busy, you may wish to bring ear plugs. During this portion of the trip we will likely experience some crowds in the National Park. You will be asked to help with some light work setting up camp.